A meter mark is a frank impressed by a franking ma-chine used instead of stamps to show that postage has been paid. In Finland this form of prepayment of post-age was approved on 22.12.1924 and detailed instructions by the Board of Post were given on 4.12.1925. 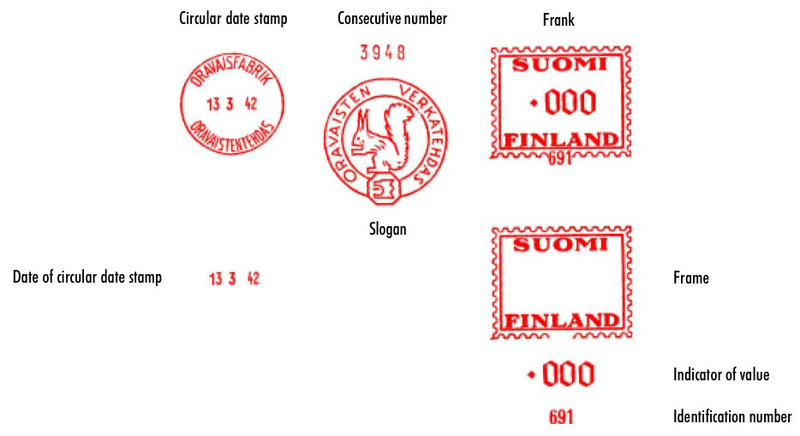 The first franking machine in Finland was taken into use on 7.1. 1926. Collectors of postal history usually classify meter marks in the first hand according to the period of use, in the second hand according to the type of machine and in the third hand according to details about the structure of the mark. There are three significant events in the history of meter marks which divide meter marks into four periods of use. These events are the monetary reform at the beginning of 1963, the introduction of ADP (automatic data processing) in the early years of the 1970’s and the transition to Load and Mail system in the late 1990’s. Concurrently with the monetary reform the model of the frank was renewed which among other things deleted the perforation from the frame. Automatic data processing lead to a renewal of the identification number system of machines with the two first numbers of the identification number rewealing the type of themachine. Load and Mail system is a remodeling connected with digitalizing of postage fees. This remodelling cannot necessarily be seen as new frank models because changes demanded by remodeling were made to the machines themselves. In this collection only such machines which have changes in frank model are placed in the chapter Load and Mail period. Generally each machine model is a separate type and they are often classified in chronological order according to the time of introduction. However, if the same model has been used in more than one period of use, the model is accordingly classified as corresponding number of types. According to their functional structure, franking machines can be divided into three types, namely single operation machines, machines with a choice of value and machines of general use. In single operation machines there is a set of complete value dies which are used one at the time to impress the whole frank. If there is no die corresponding to the amount due, several franks of lower value are impressed separately. In the machines with a choice of value there is a fixed frame and a choice of a limited number of value figures. If a value figure corresponding to the amount due is not available, the postage is composed in the same way as in single operation machines. In the machines of general use the value indicator consists of 3, 4 or 5 figures which can be set at will to show any postage (001-999, 0001-9999, 00001-99999 pennies) within the same frank. A machine of general use is intended, if dies are not specifically indicated. Structural details are dealts with in the presentation of each type of machine. Because meter mark by its definition acts as a re-placement of stamp is attention also payd to postal item and postal rates throughout the whole collection. In addition some ordinance of the usage of meter marks are introduced. The information of fares are based on Mattila's (Mattila, E., Suomen postimaksuja, Mansen merkki ja raha, Loimaa 1985), Rasehorn's (Rasehorn, H., New Postal Rate Book 1891-1991, Joutjärven Postimerkkikerho ry, Lahti 1991) and Hannula & co's (Hannula-Rasehorn-Valtonen, Modernin filatelian postitaksat, Joutjärven Postimerkkikerho ry, Espoo 2002) studies. The holder of certain machine is mentioned if it were able to find from archive sources. The usage time of a machine is mentioned in cases where several sub-jects or other sources has been used in defining. The other important source than my own volume has been the study by Hakoniemi (Hakoniemi, T., Postimaksukoneleimojen mainososatutkimus, Vaihe 1, 1977).